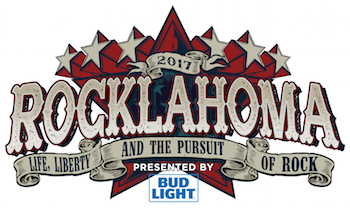 Band performance times have been announced for the 11th annual Rocklahoma, presented by Bud Light, May 26, 27 & 28 at "Catch the Fever" Festival Grounds in Pryor, Oklahoma, just outside Tulsa. America's Biggest Memorial Day Weekend Party features the best current rock artists and classic bands, led by Def Leppard, Soundgarden, and The Offspring, plus dozens more on three stages, as well as a campground stage to keep the music going all night long. Doors for Rocklahoma open at 2:00 PM each day. *Camping prices are per group, not per person. Camping prices do not include tickets to the festival. Campgrounds open on Sunday, May 21 at Noon and will remain open until Noon on Tuesday, May 30. Camping is only available with weekend ticket purchases. For more information on tickets and camping upgrades, visit www.Rocklahoma.com. As in the past, General Admission ticket discounts are available for active military through Rocklahoma partner GovX (www.govx.com). Fan voting for the annual Miss Rocklahoma competition has ended, and the Top 5 finalists have been chosen. The winner will be crowned Miss Rocklahoma onstage at Rocklahoma on Friday, May 26 at 5:40 PM.